This book deals with Vedic progression. The samhitas like Bhrigu and Arun, and the Nadis have used this technique to make astounding predictions relatihng to a very large number of biht chart that they have analysed. This technique hasd gone into disuse over the last few centuries. Desultory efforts were made in the recent past to rediscover it but without any success. The author has worked on it for long. He has described the technique very lucidly in the book and has successfully shown it s application to a large number of birth charts of celebrities and common persons. It is a powerful instrument for an overall predictive study of the future of an individual. The book is a unique attempt at resuscitating a part of India's lost astrological tradition. 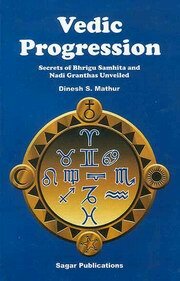 Shri Dinesh S. Mathur has been a student of astrology for long. He has particular interest in predictive astrology, which he has been practicing for over three decades. His earlier books, Predictive Astrology -An Insight and how to Time An Event, have been well received and much appreciated all over the world. The author has studied at Allahabad University and has post graduate degrees in pure Mathematics and Modern Indian History. He is a very senior civil servant and has worked in the Central Indian state of Madhya Pradesh and with the Government of India in various capacities. 2. What are the Important Basic Concepts? 3. How To Calculate a Progressed Position? 4. How to Interpret the Progression of a Vimshottari Major-period Planet? 5. Vimshottari Period and Progression of Major-period Planet. 6. How to Interpret the Progression of a Ruler of The Band of Years? 7. How to Interpret the Progression of the Major-period Planet in an Annual Chart? 8. Progression of the Karakas.